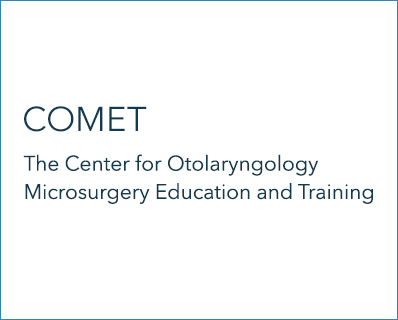 Welcome to The Center for Otolaryngology Microsurgery Education and Training (COMET). As further evidence of the George Washington's University’s commitment toward resident education, this simulation centers allows residents to rehearse different surgical techniques involving treatment for pathology of the human ear. The surgical skills fostered during training here will be actualized during the transition to real-life patient care with improved confidence to perform safe and adept surgery. Each month formal didactics are arranged in the laboratory and are preceptored by the otology faculty. These sessions are invaluable and provided real time expert feedback. Residents also have unlimited access to the laboratory for informal studies at all times. Currently the laboratory is used to simulate otology and lateral skull-base surgery. The expectation is to expand the space in the future to incorporate the other branches of otorhinolaryngology for comprehensive simulation. Mar 20 or 21 we can move this if anyone else celebrates the Persian new year!